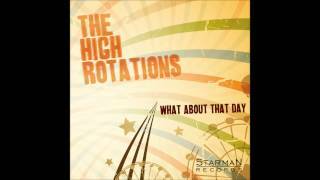 The High Rotations is a guitarband with Jan Van Laet (vocals) , Steven De Cort (drums), Freek De Meester (gitaar) and Rik Vermeir (bas). Together they bring songs about broken households, mothers in law and housewives. Really positive and exciting songs where the winding guitar sounds of Freek are wringing around the voice of Jan. To all of this there is an extremely nervous (respons) reaction by bass and drums. The High Rotations have had a great cooperation with Dirk Jans, drummer of De Mens! Without arguing! A basic demo was recorded en they considered it Good! There is a song called “Murder on a girls night out “.. Great Fun! But also bittersweet chills and Goose bumps..